During the last years of the sixteenth century, the Portuguese constructed a massive fort to protect the port of Mombasa. Designed by Giovanni Battista Cairati, Fort Jesus is one of the best preserved examples of Portuguese military architecture from the era, as well as a UNESCO World Heritage site. Today, Mombasa’s most visited attraction houses the Fort Jesus Museum. The collection includes archaeological finds not only from Fort Jesus, but from nearby sites as well. Highlights include a collection of ceramics from the Kenyan coast and what’s left of the San Antonio de Tanna, a Portuguese gunner that sank not far from the fort in the late seventeenth century. English guide books for the fort are available at the ticket desk. You’ll also encounter plenty of official and unofficial guides who will take you around the fort for a fee. Explore Mombasa’s colonial history, old town, and nature on a full-day private tour that includes entrance fees, all activities, and round-trip hotel transport. Get the perfect introduction to the city by visiting with a local guide, who will share stories about Mombasa culture and heritage, and introduce you to local cuisine in the old town market. The tour begins from any accommodation in Mombasa area and visit: Fort Jesus Historical, Old Town, Walk in the market and lunch in a local restaurant in Mombasa. Enjoy a half-day sightseeing tour of Mombasa, Kenya's second largest city. Stroll through Mombasa's Old Town—an UNESCO World Heritage Site—taking in its many mosques and fine examples of Islamic and Portuguese architecture. Explore historic Fort Jesus, a 16th-century fort in the shape of a man. See traditional dhow boats lined up along Mombasa's Old Port, then head to see the Elephant Tusks monument on Moi Avenue, the city's Indian Temple and Akamba Handicraft Industry Co-op, where you can shop for wood carvings and accessories made from beads, metals and soapstone. Part ancient city, part busy port, part sprawling metropolis, Mombasa is a thoroughly unique destination. Visit some of the city's top attractions, including the Fort Jesus Historical Museum and the bazaar, on this guided tour of Mombasa, which includes round-trip transportation from your hotel and guided commentary about the attractions. Immerse yourself in Mombasa’s diverse cultures and history on a full-day tour that explores cobblestone streets, vibrant markets, and local cuisine. With an experienced guide to introduce the best of the city, you’ll see the Fort Jesus Museum, old town’s Old Dhow Harbor, the Mombasa bazaar and market, and more, pausing to shop for handmade souvenirs along the way. This guided Mombasa tour includes lunch at Tamarind Mombasa, a seaside restaurant that’s beloved for great seafood and views of the water. Enjoy this popular day trip in the historic city of Mombasa, including a guided tour of Fort Jesus and the Old Town, a tuk-tuk ride to a local Swahili restaurant for lunch, and an afternoon at Haller Park, enjoying the wildlife.You can also explore the Akamba Carving Market. Discover the culture, origins and fun of Mombasa.This full-day city tour is part history and part shopping!Here you can explore Mombasa’s exotic markets for personal treasures. Then tour the city’s Arabic and Portuguese past and witness their present-day influence on this colourful metropolis.Later visit the haller park.The Park consists of a Game Sanctuary, Reptile Park, small demonstration Fish Farm area, Palm Garden, Crocodile pens and a giraffe viewing platform, offering a variety of attractions at the various points to educate and entertain the over 160,000 visitors who visit the park every year.The diversity of vegetation is considerable, from mangrove palms and majestic indigenous shade trees to coastal forests where several of these plants are rare and endangered; ahaven for botanist. Yet each plant plays an important role in the overall harmony of the ecosystem. The tour begins from cruise ships docking in Mombasa port and we bring you back to the port on time for onward travels: Fort Jesus Historical Museum, Old town, Walk in the market and lunch in a local dishes restaurant in Mombasa, Mombasa Giant elephant Tusk monument and afternoon visit to the haller park. Explore Mombasa’s old town and nature on a full-day, guided tour that includes entrance fees, all activities, and round-trip hotel transport. Get the perfect introduction to the city by visiting with a local guide, who will share stories about Mombasa culture and heritage, and introduce you to local cuisine in the old town market. 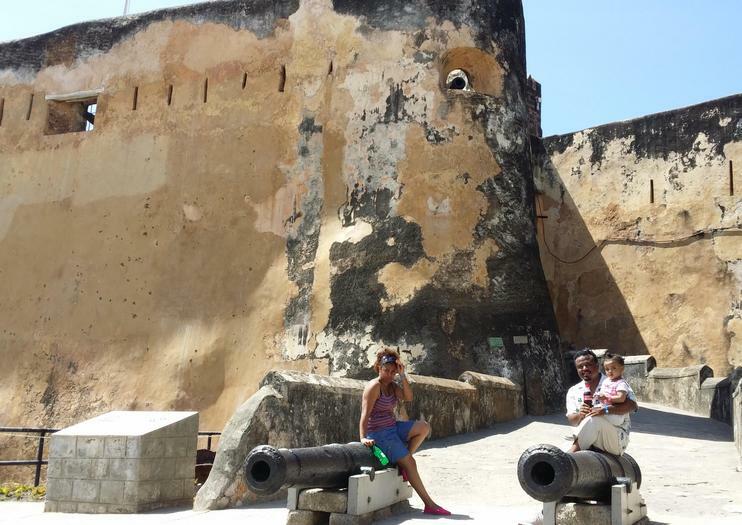 This is a short guided tour in Mombasa will take you though the Old Town, Fort Jesus, Food and Spice Market, Old Harbor and famous Mama Ngina Drive.